Parents are hearing more and more about the benefits of probiotics and how we should introduce them into our children’s diets. But what are probiotics? What do they do? How can they improve our children’s health? And how do we introduce them to our kids? We’re taking a deeper look and sharing our findings with you! Probiotics are the good bacteria and yeasts that already live in your body that support good gut health. Probiotics are live microorganisms that are known to be good for you and your health because they have shown to help prevent and treat some illnesses. They are great for your digestive system, support a healthy immune system, and so much more. How can probiotics improve my baby’s health? It wasn’t until recently (the mid-1990s) that the buzz around probiotics had people wanting to learn more. Several studies have helped to cement our understanding about the benefits of probiotics and the importance of a balanced gut microbiome. Babies’ tummies can experience a lot. They could have colic, acid reflux, diarrhea, constipation, gas issues, or even more series digestive issues such as Irritable Bowel Syndrome (IBS) or Crohn’s Disease. It’s miserable watching your child in pain and feeling like there is nothing that you can do about it to help them feel better. Luckily more studies are finding that having good gut flora and the proper balance of gut bacteria can help, treat and even prevent many of these issues. Not only that, multiple studies are suggesting that babies who take or eat foods with probiotics have fewer experiences of colic and shorter crying spells due to experiencing less upset stomachs. I think all parents want that for their children! It feels like whatever germs there are–in the air, in the house, wherever!–baby picks them up. Isn’t that how it always works? And we all know that having a sick baby is the absolute worst. This is why we mothers always try to do our best to keep the germs at bay. But did you know that 80% of our immune system resides in our gut? That’s huge! I was shocked to discover that it was such a high percentage. What does that mean? It means that having good gut bacteria and a healthy digestive system also leads to a healthier and stronger immune system for baby. It also means that if baby is introduced to probiotics, he will be less likely to catch colds, flus, and other illnesses. Something else that I found interesting was that according to a few studies, the consumption of the Lactobacillus and Bifidobacterium strains have proven to reduce certain acute respiratory symptoms (like catching a cold or experiencing allergies). We’ve also discovered (here and here) that when there is a gut flora imbalance it leads to excessive weight gain, insulin resistance, diabetes, and fatty liver disease. This is a major reason why more parents are beginning to introduce probiotics to baby. It’s not just for the short term benefits but also for the long term since it can impact their weight and overall health as a child and as they grow. Another (more common) reason why parents have been introducing probiotics to their babies is to help with different skin issues. For example, rashes, eczema, baby acne, and cradle cap. Several studies have shown that there is a link between people who have acne and other skin conditions and digestive issues. Acne patients have been shown to have considerably more leaky gut issues and inflammation than those without acne. Interesting, right? Another study found that sub-optimal gut flora also contributed to the skin being less efficient as a protective organ and more susceptible to inflammation and infection. Some sources say that baby skin issues are caused by imbalanced gut flora. These are all reasons why more parents are jumping on the probiotic bandwagon. Something else that we’ve learned about gut bacteria is that it can directly affect one’s mood, from depression and anxiety to shyness. The brain-gut connection is real. One study found that feeding mice Lactobacillus probiotics helped reduce anxiety. Another study found that different gut bacteria can actually change a mouse from timid to bold and vice versa. How can I introduce probiotics to my baby and kids? After all of this research, it’s a no-brainer that probiotics are great for us and for baby. We now know how important gut health is, but how can we provide probiotics to our babies to make sure that they have healthy gut flora? When babies are younger than 6 months old breastfeeding is the best way to add probiotics to their diet. We obviously know that breast milk is amazing and helps keep baby’s gut lining intact, sealed and healthy. And of course what you eat is important so make sure that you’re eating foods that are rich in probiotics such as kefir, yogurt, dark chocolate (yes, please), sauerkraut, pickles, miso, etc. This will not only help you and your health, it will help your milk and your baby. Pretty much none of the previously mentioned food options are great for small kids (miso and sauerkraut, yeah right), but yogurt is a delicious and excellent choice for probiotics! When looking for the right yogurt for baby, I discovered that Stonyfield is the #1 Pediatrician Recommended yogurt. 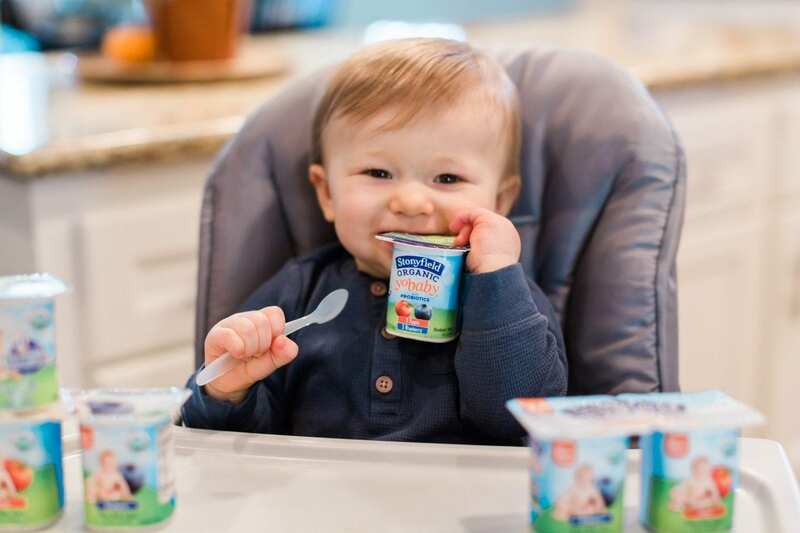 I have tried Stonyfield before and love their other products so it was great to know that their yogurts for babies are also highly recommended. My nephew LOVES them (as you can see)! 😉 I really liked learning that the YoBaby organic yogurts are made especially for babies with only organic whole milk and with the best ingredients–made without the use of artificial hormones, toxic persistent pesticides, and GMOs. Stonyfield has been around for over 30 years and their mission as well as quality of products makes them a brand that we are proud to stand behind. For a healthier you and healthier baby you can do something so simple–add yogurt to the menu! With all of the benefits that we’ve found about probiotics it’s a no-brainer. We are a yogurt loving family so we had to share with our readers the brand that we love and recommend if your wanting to add probiotics into your little one’s life. Check out Stonyfield. We promise your baby will love it too!